Baku, Azerbaijan travel highlights including the Old City (Icheri Shahar), local markets and people and a day trip to Gobustan. Read about our visit to Baku and the rest of Azerbaijan. 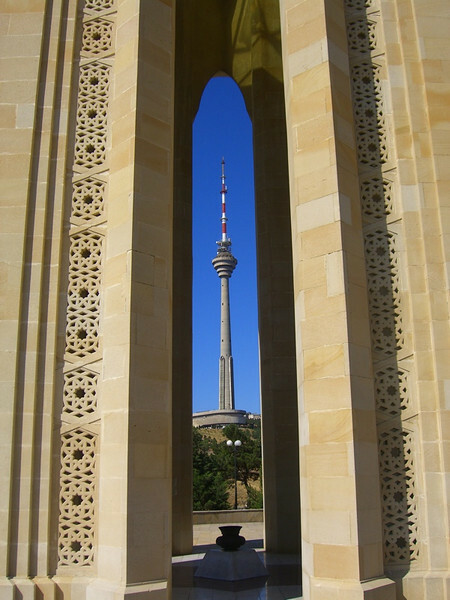 Baku's TV tower looms over Martyr's Alley (Shahidlar Xiyabani) and the monument of the eternal flame. Martyr's Alley was originally a cemetery to honor those (about 130) who died on 20 January 1990 at the hands of the Soviet Red Army. The cemetery now includes those who died in the Nagorno Karabagh conflict. ..It's a peaceful cemetery whose headstones are adorned with etched faces of the deceased. Read about our visit to Baku and the rest of Azerbaijan. Much of Baku is under construction and is being "renewed" with skyscrapers at every corner. If you get lost, as we are apt to do, you might stumble upon a quiet back street with simple balconies and nostalgic architecture. Read about our visit to Baku and the rest of Azerbaijan. Just about every trip through Baku seemed to take us past the Baku Philharmonia. Each time our host Yahya would drive by this building, he'd joke about the growing number of Philharmonias Baku has these days. 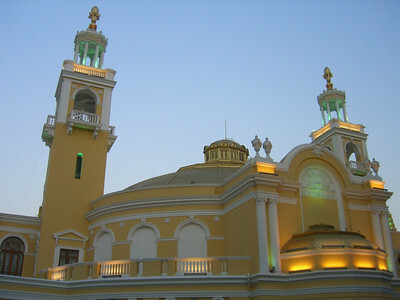 This European styled building sits atop City Park with the old town below. Read about our visit to Baku and the rest of Azerbaijan. 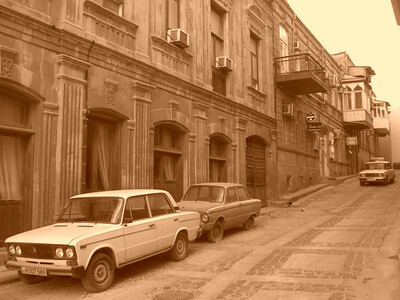 Many buildings in Baku were designed by European architects at the beginning of the 20th century with newfound oil wealth...Some streets look reminiscent of Paris or Vienna. This new building combines local and foreign designs to house the Heydar Aliyev Foundation Building. Read about our visit to Baku and the rest of Azerbaijan. Charles de Gaulle stayed in this Paris-inspired building (Hajinski Mansion) in 1944 when he was on his way to meet Stalin in Moscow. 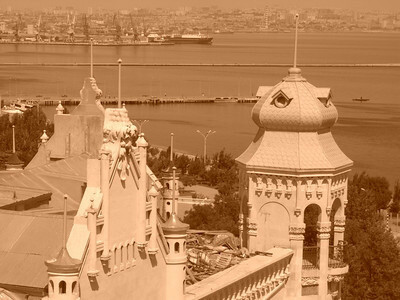 Baku's active port and skyline are in the background. © UncorneredMarket.com Read about our visit to Baku and the rest of Azerbaijan. 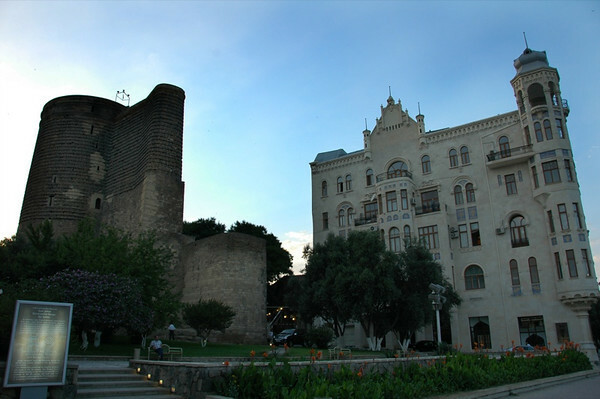 The entrance into Baku's Old City (Icheri Shahar). Read about our visit to Baku and the rest of Azerbaijan. 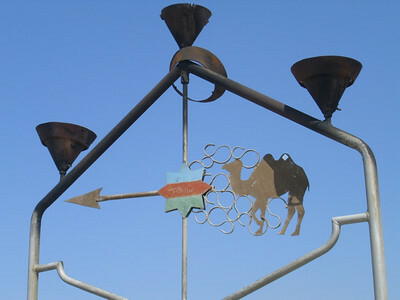 A weathervane? Or a road sign for camels? Read about our visit to Baku and the rest of Azerbaijan. Soviet era mosaics also mark buildings and bus stops in Baku. 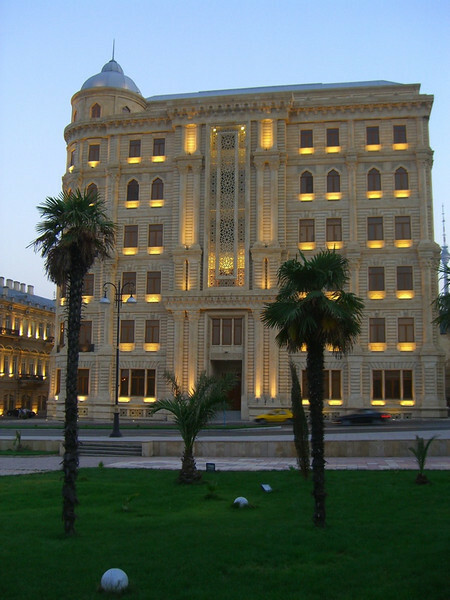 Read about our visit to Baku and the rest of Azerbaijan. This eight-storey windowless tower is a bit of a mystery. 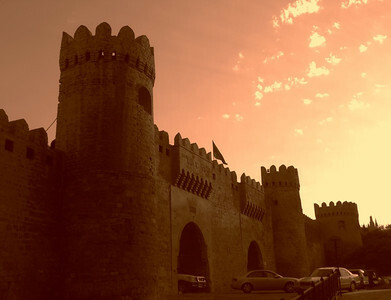 Reconstruction took place in the 12th century, but its history likely dates back much further...The legend we enjoy most is the one that tells the story of a father who falls in love with his daughter and builds the tower for her. 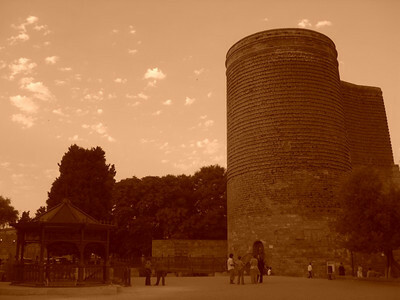 She tells her lovestruck father to continue building it higher, until its eventually high enough, after which she throws herself from the top floor... Read about our visit to Baku and the rest of Azerbaijan. 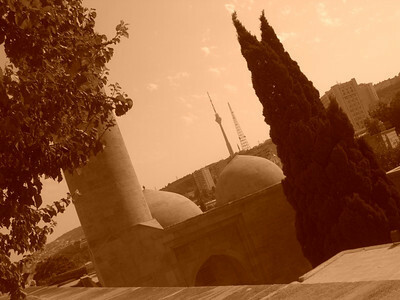 A peek at the Baku skyline from the domes of the mosque at Shirvanshah's palace. Read about our visit to Baku and the rest of Azerbaijan. 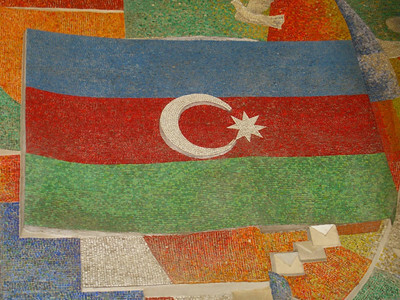 The Azerbaijani flag is decked out in mosaics in Baku. 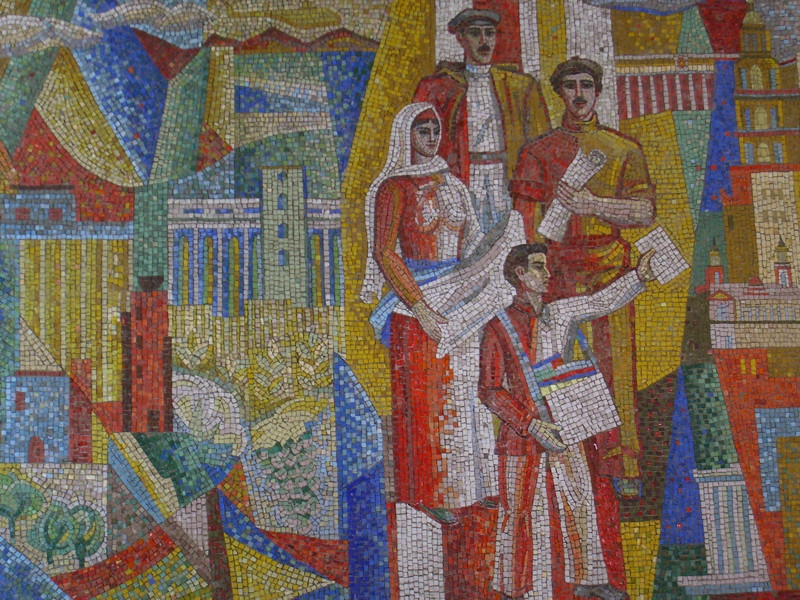 If you keep your eyes open in Azerbaijan, you'll find mosaics on the side of buildings, at bus stops and in other unsuspecting places. Read about our visit to Baku and the rest of Azerbaijan. 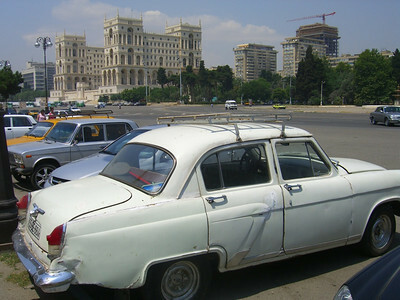 Dom Soviet stands along the waterfront road as cranes rise behind...An old Volga graces the foreground. Read about our visit to Baku and the rest of Azerbaijan. 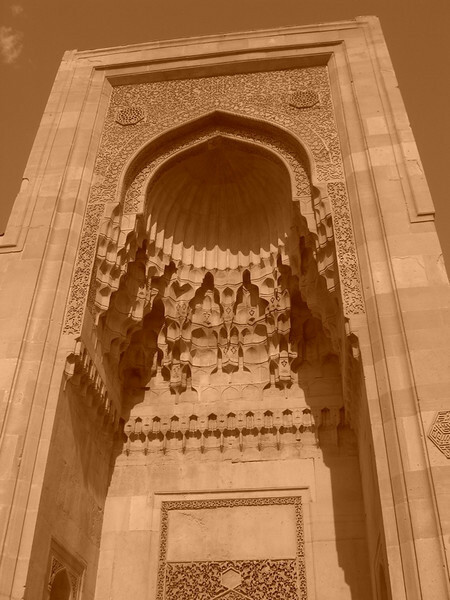 An elaborately carved doorway marks the entrance to the Harem at Shirvanshah's Palace. Read about our visit to Baku and the rest of Azerbaijan. 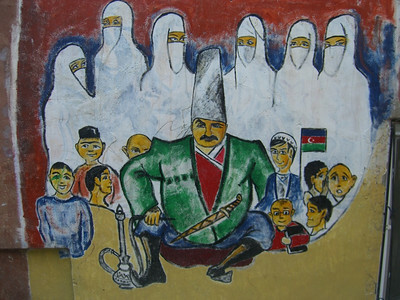 Some of the more colorful graffiti off the beaten track near Baku's Taza Bazaar. Read about our visit to Baku and the rest of Azerbaijan. Twelfth century Maiden Tower and 20th century European-styled Hajinski Mansion sit juxtaposed. Read about our visit to Baku and the rest of Azerbaijan. 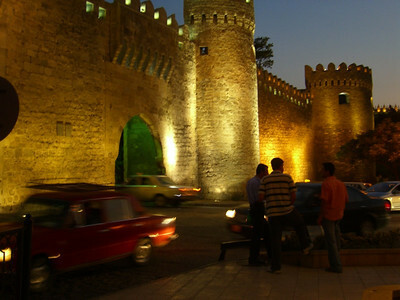 Evening entry into Baku's old town. Read about our visit to Baku and the rest of Azerbaijan. 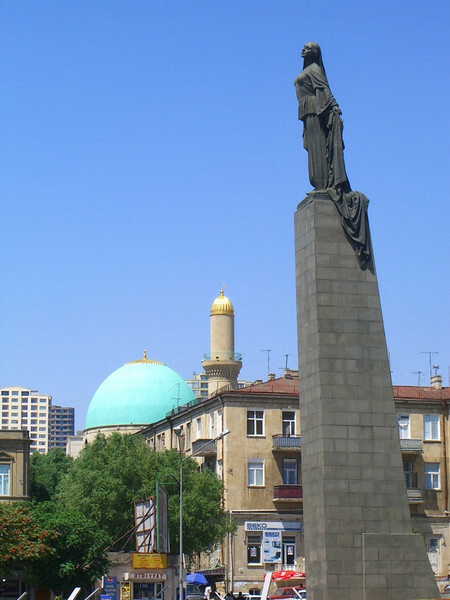 This statue of a woman throwing off her veil is coincidentally right in front of the Iranian Embassy and Haji Sultanli Mosque. Read about our visit to Baku and the rest of Azerbaijan. 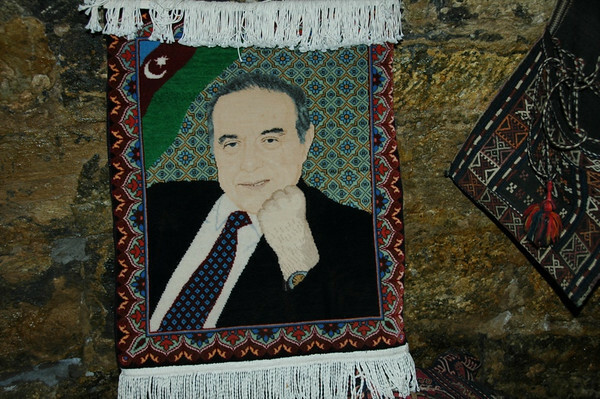 The deceased President Heydar Aliyev in woven form. This rug decided it - please don't make a carpet out of our likenesses after we pass. Just not pretty. Read about our visit to Baku and the rest of Azerbaijan. 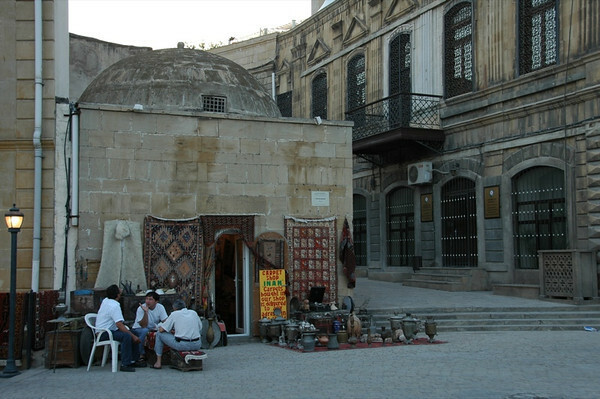 Vendors enjoy an evening tea and a game of backgammon on the streets of Baku's Old City (Icheri Shahar). Ceramics, carpets and metal works are on sale at every corner. Beware when buying carpets - only those with a certificate can leave the country. Read about our visit to Baku and the rest of Azerbaijan. 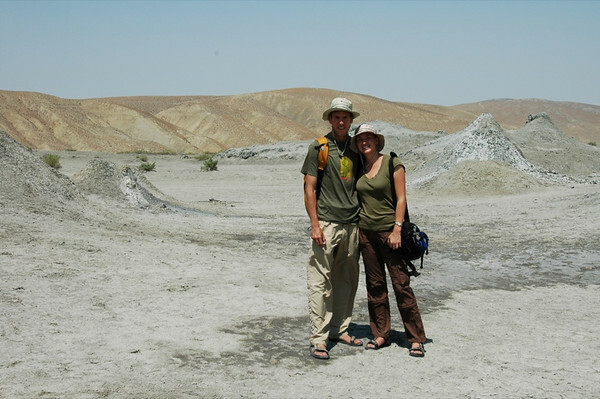 Dan and Audrey give proof that they actually travel together. Read about our visit to Baku and the rest of Azerbaijan.